Lubuto Library systems are designed to leverage professionally trained librarians to support the nonprofessional staff. 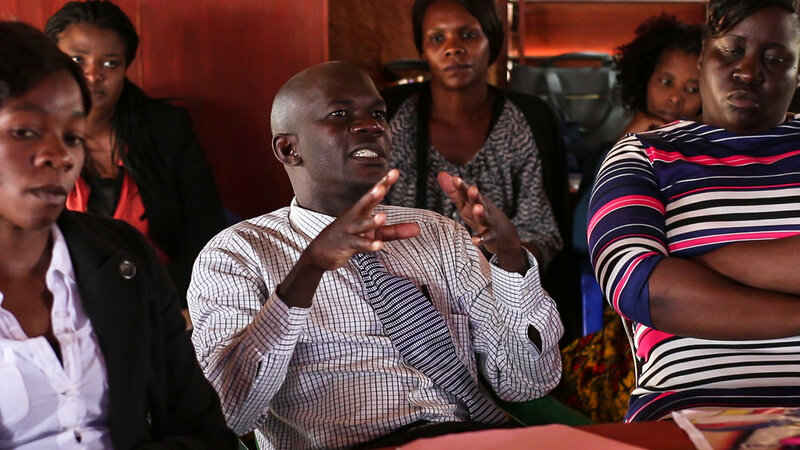 Lubuto’s training model includes long-term in-service training of library staff by experienced library managers and short-term specialized training in library services, program facilitation, and outreach to vulnerable groups. 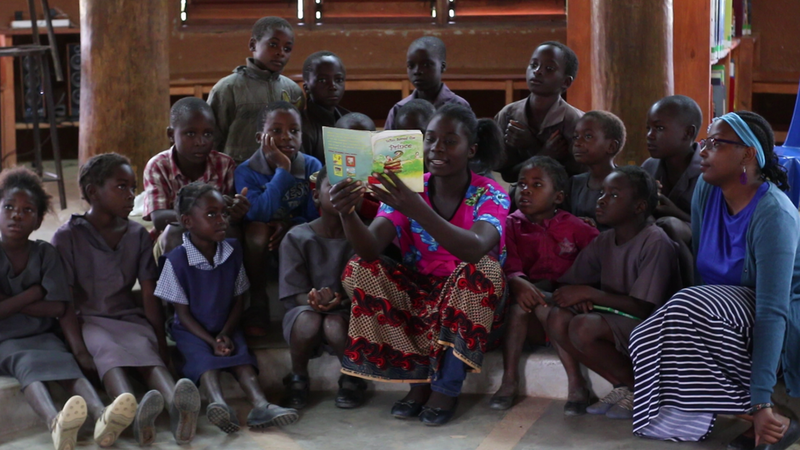 Both by modeling high-quality library services to children and youth and by directly teaching them (at, e.g., the University of Zambia) Lubuto aims to raise the quality of education in schools, libraries and households, as well as to highly vulnerable populations. Library staff are trained in children’s and teen library services such as outreach, storytelling and book-based literacy programs, digital literacy instruction, collection development, and coordinating programs and services. Lubuto provides and trains staff in systems to collect data on library use and impact, compiles data on users and the collections and provides ongoing professional guidance to the library programs, as well as new programs and materials for the book collections. Librarianship for children and youth in Africa requires efforts going far beyond traditional collection development and the acquisition of print and digital resources. In Zambia, Lubuto found demand for the full range of activities that libraries throughout the world undertake: active involvement with preservation; programming that supports leadership development, health, and gender equity; technological innovation for teaching children to read in their mother tongues; advocating for free internet access in public libraries; creating context-appropriate information literacy programming; and, most of all, for education and training of specialist librarians. Lubuto and the Library and Information Association of Zambia (LIAZ) coordinated a workshop on children's library services at Mumuni Library for Zambian librarians. This was the first time that council and provincial librarians in Zambia have ever been invited to a joint workshop—many met each other for the first time! Government also had a strong presence at the workshop. Director of Teacher Education and Specialized Services Mr. Kamutumwa and Chief Librarian of the Zambia Library Service Robinson Bwato were both in attendance. Holding the training at Mumuni showcased some of the unique features of our first rural library. Most participants had never been to a training at a similar type of location. They particularly enjoyed the hands-on nature of the event. The participants were even able to put what they learned into practice immediately—working directly with the children of Mumuni Library. Velenasi Munsanje, President of LIAZ, delivered a speech declaring that librarians as part of the public service profession should be immersed in a community setting for training. A popular challenge of the workshop was to come up with a new program focused on children and youth that they can introduce for free at their libraries over the next three months. Everyone submitted forms and they will provide updates on the programs, which will be presented at LIAZ's annual meeting. Some ideas included: introducing mentoring sessions, music and arts programs, programs on computer basics, drama programs, book talks about children’s literature, early literacy programming, outreach and literacy programs for young people. Lubuto is committed to strengthening Zambian and regional publishers and our efforts to date have been greeted with enthusiasm, and—frankly—a measure of surprise, by private and government publishers alike. Successful publishers worldwide see libraries as major consumers of their books, and they heavily focus their marketing efforts on libraries. Those publishers realize that libraries play a central role in promoting their books, making the populace aware of them, so that even if they lend books for free, the libraries create demand that drives sales of the books as well. When Lubuto began creating the Zambia Heritage Library to preserve beloved literature that was long out of print, we were thrilled to learn that the recently-strengthened ZEPH had begun bringing those classics back into print. Discovering our mutual desire that those books be made available to new generations, our two organizations began explore ways we could work together to achieve that goal. When our friends from ZEPH first learned about Lubuto’s work to strengthen library services to young people, and how we recognized the value of Zambia’s past literary treasures, they offered to give us their publications. We gratefully asked to purchase them instead. Their production of well-priced, high-demand books needs to be valued and supported by consumers in order to thrive. From the librarian perspective, it’s simple, and rather obvious: libraries thrive when publishers, booksellers and authors thrive. A robust publishing industry is necessary for the educational and intellectual life of a society, and good librarians play a very active role in that life. Unfortunately, the progress of African publishers and booksellers has been impeded in recent years by well-meaning external book donation programs from wealthy areas. The deleterious effects of large-scale book donation programs on African publishers have long been understood and widely discussed. But the damage they have done to libraries has been less identified and articulated. Those activities are what make libraries effective and valued, inspiring stakeholder investment and support. The quality of a library is not measured by the quantity of books it holds, but, rather, by the quality and impact of its collections and services. In a recent round of workshops held in early 2017 to develop training materials for school libraries in Zambia, among the international standards contributed by Lubuto’s Director of Library Services, Elizabeth Giles, was the importance of librarians evaluating donated materials by the same criteria as materials being purchased for library collections. A good and effective library always pays close attention to developing a balanced and appropriate collection; it can’t be “given” to them from an external source. Beyond the library perspective, strengthening Zambia’s publishing and bookselling industry can inspire Zambians to become authors and illustrators and greatly increases access to affordable books among children and youth. This is also an important aim of the Zambian Board on Books for Young People, an organization Lubuto was instrumental in founding about a decade ago, and why Lubuto is an affiliate of the Book Publishers Association of Zambia. Zambian, and even South African publishers have generally not been accustomed to demand for their publications from the library market. Some local publishers have been so enthusiastic and responsive to our ongoing identification and purchase of their books that they literally show up at our office now with armloads of newly published titles for Lubuto libraries. They call us each time they publish a new title that they think may be of interest for the libraries. This would not seem unusual to librarians in areas where a vibrant publishing industry exists, but sadly this normal relationship between publishers and libraries has not always been the case in most Anglophone African countries. This synergistic relationship not only makes library collections more responsive, relevant and effective—making libraries more successful and impactful—but a strengthened local publishing industry supports literary expression and consumption. 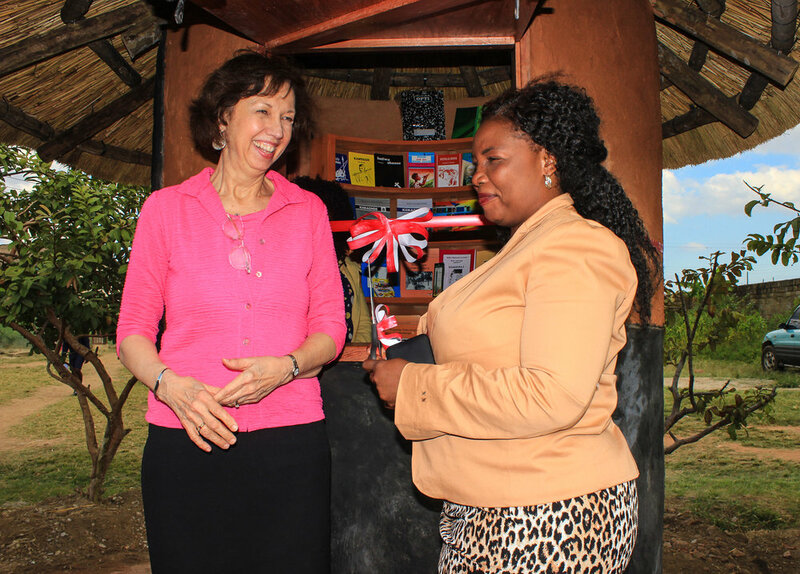 On May 22, 2017 we inaugurated a kiosk we constructed at the LLP Model Library (formerly Ngwerere Library) as a sales outlet for the government publishing house, the Zambian Educational Publishing House (ZEPH). To support sales of their very reasonably-priced books, we display ZEPH’s publications on an ongoing basis in the library, including the textbooks they publish that comprise some of Zambia’s school curriculum, even though textbooks are not part of Lubuto Library collections. We do this to encourage people who are interested in helping get textbooks into schools to purchase the Zambian curriculum materials rather than donate surplus textbooks from other countries that do not support the local curriculum. Lubuto and ZEPH agreed on this plan to support sales of ZEPH books in 2014 and Lubuto subsequently developed the kiosk’s design, consistent with the indigenously-inspired architecture of Lubuto Libraries, in consultation with them. Generous funding for its construction was provided by Harriet McGuire, a long-time supporter of LLP’s work who was Cultural Affairs Officer at the American Embassy in Zambia from 1983 to 1986. Lubuto recognizes, along with Harriet McGuire, that promotion and support of the commercial publishers and booksellers in Zambia is also of central importance. To underscore this essential partnership, the May 22nd event to launch the ZEPH sales kiosk at LLP’s Model Library brought together representatives of the Book Publishers association of Zambia, and in addition to ZEPH representatives, Zambian publishers Gadsden Publishers and Maiden Press brought a selection of their titles to display in the library’s reading room. Also present was Efi O’Donnell of Planet Books, one of Zambia’s commercial booksellers from whom those and other local publishers’ books may be purchased. From the library world we warmly welcomed many colleaugues from the library profession and the Library and Information Association of Zambia. We hope that this new cooperative venture is a first step towards Zambia’s librarians, publishers, booksellers and writers working and thriving together toward an informed, educated and literary future for Zambia.